Like many Burmese dishes this soup is quite simple. But simple doesn´t me it can´t be delicious. This soup tastes fantastic. You´ll find Ohn no khao swè in the whole country eaten by local people. Next to the national dish Mohinga this soup is also very popular. In Myanmar the locals use all parts of the chicken to cook this soup. The bones will give this dish even more flavor. 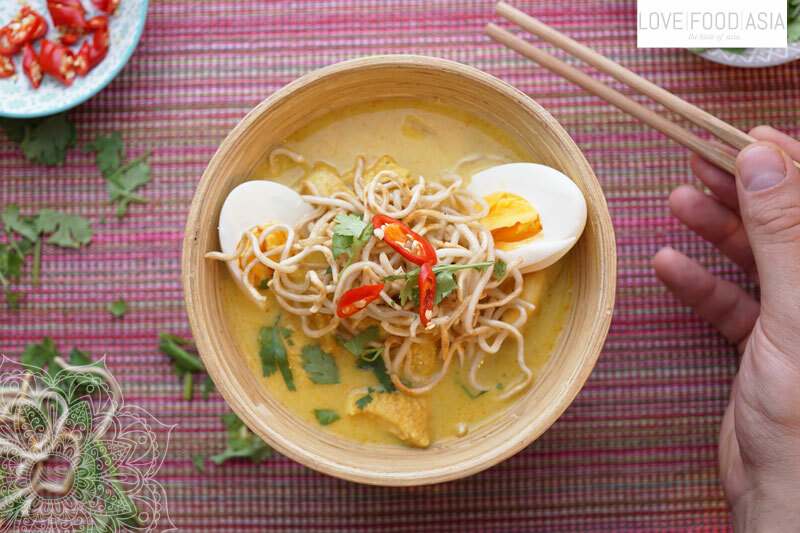 Ohn no khao swè bears similarity to the Malaysian laksa, while its closest relations can be said as the khao soi of Chiang Mai and Luang Prabang, and the Indian khow suey which was inspired by Ohn no khao swè. Soak garlic flakes in 2 tbs water. Soak Mie noodles in warm water for 10 minutes. Cut chicken breast in thin slices and toss with cayenne pepper, ground Paprika, turmeric and flour. Heat oil in a pan and stir fry chilis, chopped onions and chicken dice mix on high heat. Add veggie stock, coconut milk, ginger, lemongrass and onion rings. Simmer on low heat for 5 minutes. Boil Mie noodles for 3 minutes and drain. Heat 1 tbs oil in a wok. Stir fry noodles and soaked garlic for 5 minutes. Season soup with salt and pepper. Serve with fried noodles, boiled eggs and coriander leaves.